I am writing this blogpost from Zurich, Switzerland. I am in Switzerland because of the 18th Swiss Transport Research Conference (SRTC), which took place May 16-18, 2018 in Monte Verita, Ascona, Switzerland. When the invitation to give a keynote talk at this conference arrived months ago from Professor Kay Axhausen of ETH Zurich, I immediately accepted. The timing was ideal - just after our multiple UMass Amherst graduations signalling the end of another great academic year and before the CORS Conference in Canada and other exciting events. Also, since I love doing research in transportation and logistics and teach in this area, the conference theme was ideal. The organization of the conference was outstanding and my itinerary was planned to the greatest detail and with fabulous care and thoughtfulness and I am incredibly grateful. I arrived in Zurich on Monday, after a very comfortable flight from Boston Logan on Swiss International. My hosts had even researched which would be the ideal seat for me in business class! On Tuesday, I met with Professor Kay Axhausen and doctoral students as well as a colleague from Denmark, Professor Otto Nielsen of DTU, whose seminar talk I very much enjoyed. Another special treat, which demonstrates the serendipity of travel - I got to meet the nephew of Professor Dietrich Braesss of Braess Paradox fame, who is now at ETH Zurich and we took the photo below. Then we had a lovely dinner in the Old Town part of Zurich. What would a transportation conference be without exploring and experiencing modes of transport? So, last Wednesday, a group of us convened at the Zurich Central Train Station to begin our journey to the conference site and we only had one change of trains (on our return yesterday we had two). The scenery was spectacular with lakes, mountains, valleys, and lovely homes as well as animals ranging from big cows to sheep. We were met by a bus at the Lorcano train station, which drove us to a point on a mountain at which we disembarked and made our trek up to the conference venue, Monte Verita. The photo below I took from my villa hotel room. 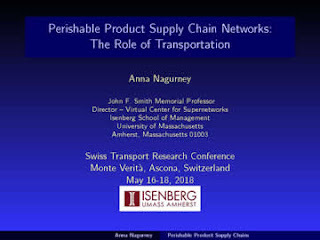 I was so honored to open up the conference with my keynote talk: Perishable Product Supply Chain Networks: The Role of Transportation, which can be downloaded here. The conference was organized with only two parallel sessions plus three keynote talks as well as discussion sessions. All the meals were included as well as breaks, which allowed for numerous opportunities for discussions and conversations. I thoroughly enjoyed brainstorming about the present and future of transport around the globe and expectations for impacts on cities, rural communities, and the world, with innovations in autonomous vehicles as well as shared mobility. It was fascinating to speak with researchers and doctoral students as well as practitioners from Europe, the US, and Asia. The beauty of the venue was breathtaking, as was the elegance, and exceptional organization of the conference. Some other highlights included meeting a doctoral student from the University of Catania in Italy, who told me that one of his absolutely favorite professors was Professor Patrizia Daniele, with whom, coincidentally, I had published yet another paper just this past week. Also, meeting Professor Norman Garrick from the University of Connecticut was very special. He is now on sabbatical at ETH, which is one of the top universities in the world. I thoroughly enjoyed hearing the keynote talks by Professor Caspar Chorus from TU Delft in The Netherlands and by Claudio Ruch from ETH Zurich. We took the group photo below. This was a conference that set new standards. I would also like to thank the sponsors for making this conference possible. I thoroughly enjoyed conversations with representatives from SBB (Swiss Railways) and from Swiss Roadways. The transportation experiences have been idyllic and the conference was as well. Kudos to Professor Kay Axhausen and also special thanks to his research assistant, Mr. Felix Becker. This is truly an exceptional time of the year in academia - filled with college graduations and celebrations. Tomorrow is also Mother's Day and although I am flying to Switzerland to give a plenary talk and have not yet even started to pack (but my talk is done) I had to write this blogpost. The special celebrations began on Thursday evening. The Isenberg School PhD Program Director, Dr. George Milne, 3 years ago started a robing ceremony in which PhD advisors get to speak about their PhD student(s) that are graduating and get to "robe" them. The Isenberg School graciously purchases the lovely maroon robes for our PhD graduates. This year eight PhD recipients took part in the robing ceremony with the program below. The ceremony took place in the Flavin auditorium at the Isenberg School. 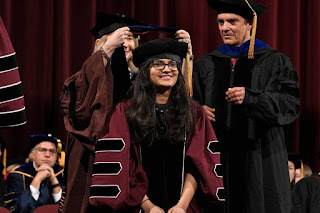 I was there to robe my 20th PhD student, Dr. Shivani Shukla, who had traveled from California, where she is now an Assistant Professor of Business Analytics at the University of San Francisco and absolutely loves teaching and conducting research there. My present doctoral students came to support her and Dr. Milne began the evening with opening remarks and was a fabulous master of ceremonies! As part of the ceremony, each PhD graduate's dissertation advisor gets an opportunity to give a speech about the graduate. It was a pleasure to speak about Shivani (Dr. Shukla), who excelled in all dimensions of research, teaching, and service as a doctoral student and is now thriving as an academic. She not only was elected President of the award-winning UMass Amherst INFORMS Student Chapter, and her thesis: Game Theory for Security Investments in Cyber and Supply Chain Networks, has resulted in multiple top journal publications and a book chapter, but, in 2016, she was recognized for her exceptional teaching, over multiple semesters, of the required undergraduate statistics course for all business majors at the Isenberg School, with the Outstanding Doctoral Student Teaching Award. We took a few group photos and then proceeded to the Integrated Learning Center where there was a fabulous and very delicious reception for all the Isenberg grads who were receiving graduate degrees! I enjoyed taking the photo below of Dr. Shivani Shukla and we sampled the exquisite desserts. 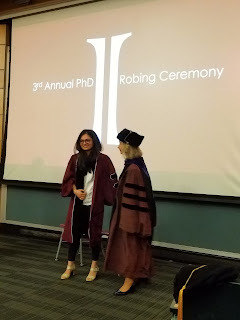 The next morning it was time for the UMass Amherst gala graduation at the Mullins Center in which PhD students get "hooded" by their PhD advisors. Close to 200 received their PhDs and there were over 1,000 Master's degree recipients. UMass Amherst took the above very special photo, which is a very special remembrance and for which I am very grateful. After the graduation ceremonies, there was a reception, at which we saw many friends and their PhD advisors. In the photo above are: Professor Ana Muriel, Rodrigo Mercado, Dr. Shivani Shukla, Deniz Besik, Pritha Dutta, Dr. Michael Prokle (Professor Muriel's student), and yours truly. Dr. Prokle was also a former President of the UMass Amherst INFORMS Student Chapter. Deniz was this year's President and Pritha, the year before. And, as we continued to enjoy the refreshments and conversations, we saw more friends and graduates, including Katerina Delaili, who received her Master's in Engineering. Coincidentally, all the students below have taken my Humanitarian Logistics and Healthcare class and all have been outstanding contributors to the UMass Amherst INFORMS Student Chapter, which I have served as a Faculty Advisor now for 14 years. And, in an extraordinary gesture of kindness and thoughtfulness, I received a letter from Dr. Shukla's parents in India, with words of exceptional gratitude that I hope that I can continue to live up to. Congratulations to all the graduates, including the Isenberg School undergraduate class of 2018, the ceremony for which I attended this morning, again in a jam-packed Mullins Center! So honored and grateful to be a professor and to have students, who make a difference, and who continue the lineage of education and research. This is that time of the academic year during which classes are over with, some final exams are still taking place, faculty are busy with grading, and many are looking forward to college graduations and associated celebratory events. 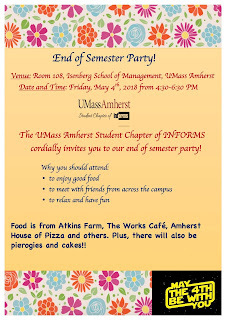 Yesterday, we held our end of the semester (actually, academic year) UMass Amherst INFORMS party. That morning I was busy with a School Personnel Committee Meeting at the Isenberg School and then it was time to catch up on some research and to get ready for the party. My husband and I were bringing two varieties of warm pierogies, kielbasy, and some very special Italian cookies bought in Springfield. The award certificates for the outstanding Chapter Officers were prepared and these were given out after everyone had consumed a great deal of delicious foods and also had terrific conversations! The venue for the party was the Isenberg School of Management. Next year will be the 15th year that I have served as the Faculty Advisor to this award winning INFORMS Student Chapter, which was established in 2004. Many of our members have gone on to receive their PhDs and have assumed jobs in academia or industry and, at least one, is now a Full Professor. Four former Chapter Officers (Tina Wakolbinger, Patrick Qiang, Amir H. Masoumi, and Michael Prokle) have been awarded the Judith Liebman Award from INFORMS for their various activities and leadership roles and I had the pleasure of nominating all of them. This past year, we have hosted 8 speakers (from MIT, WPI, UMass Amherst, Babson, MITRE, Australia, and Turkey), had a STEM Slam, held a tune-up for the INFORMS conference in Houston, and have had several social events. It has been an extraordinary year. The turnout for yesterday's party was fabulous with faculty coming not only from several Isenberg School departments (Operations and Information Management, Finance, and Management), but also from the UMass College of Engineering (Mechanical and Industrial Engineering as well as Civil and Environmental Engineering), and from the College of Information and Computer Sciences. Numerous students and even relatives and friends and at least one fiancee were also in attendance! I was delighted that several of the students in my Humanitarian Logistics class also came to the party and there was a guest from Germany, who had just completed a stint in Haiti working with Engineers Without Borders. There were students from Greece, Turkey, China, Iran, Sierra Leone, Mongolia, India, Germany, Colombia, Mexico, and even the USA at the party! It is wonderful to see the great Operations Research and Management Sciences community that has been built at UMass Amherst with the INFORMS Student Chapter as a unifying entity. A big thank you to all the faculty who came during this busy time of year to our party (Professors Senay Solak, Mila Sherman, Eric Gonzalez, Eleni Christofa, Erin Baker, Ana Muriel, Chaitra Gopalappa, Peter Haas, Shannon Roberts, Anuraj Sharma, and Lad Nagurney from the University of Hartford) - this means a tremendous amount to the students. We had a special cake and then it was time to give out the award certificates. We took a group photo. And, at the party, I was very touched by a lovely thank you note given to me. Yes, I keep them all and very much appreciate the thoughtfulness. See some of you at the graduations and wish everyone a very wonderful and productive summer, filled with great research, writing of articles and books, exciting conferences and travel, and the construction of lovely memories.